Turmoil continues to surround the Cleveland Cavaliers. With the taste of Saturday’s blowout loss to the Oklahoma City Thunder still lingering, the team held a meeting prior to its Monday practice. According to one NBA insider, several players questioned whether the sickness that kept Kevin Love from completing the game was legitimate. If fans needed any more proof that things are very far from okay in Cleveland at the moment, this is surely it. 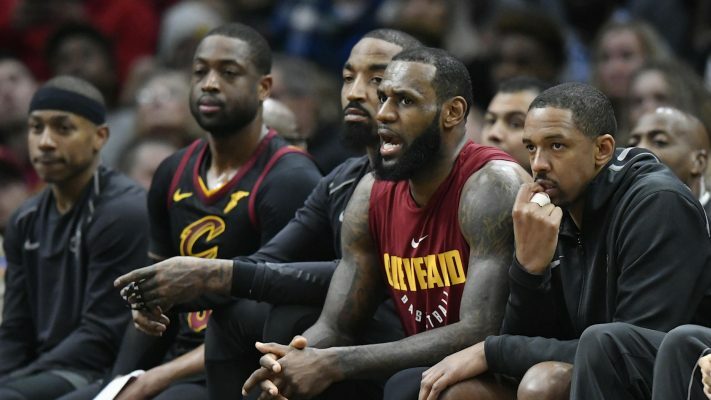 The Cleveland Cavaliers held an emotional team meeting prior to Monday’s practice, where several players challenged the legitimacy of Kevin Love leaving OKC loss on Saturday ill and missing Sunday’s practice, league sources tell ESPN. In a locker room increasingly full of finger-pointing, Love defended himself and explained his side to teammates, coaches and management, sources said. At end of meeting, there was a sense with some that team had worked out some issues, but that ultimately remains to be seen. It’s quite clear that the troubles the Cavs are having on the court have transferred to the locker room. It’s possible that giving up 148 points to the Thunder in their ninth loss in 12 games has caused tensions to boil over. Last month, LeBron James pegged trust and chemistry as two of the main issues that have plagued the Cavs this season. While James was speaking about trust on the court then, it is clear that trust off the court is now an issue as well. There is no end in sight for the issues that are currently taking place in Cleveland right now. Hopefully, the emotional meeting got through to the team, but as the report indicates, that remains to be seen.